In an AT&T-sponsored survey of frequent drivers who text daily—regardless of where they are—98 percent said they were aware of the dangers of texting behind the wheel. Nonetheless, three-quarters of them admitted to texting while driving, despite broad public-service campaigns and laws against it in some states. Two-thirds said they have read text messages while stopped at a red light or stop sign, while more than a quarter said they have sent texts while driving. More than a quarter of those who texted while driving believed they "can easily do several things at once, even while driving." 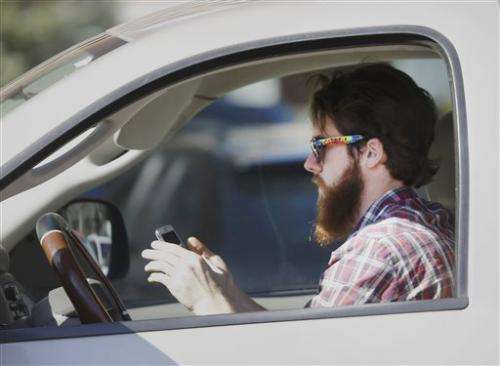 AT&T Inc. released the survey Wednesday as part of an anti-texting-and-driving campaign. AT&T designed the survey with David Greenfield, founder of The Center for Internet and Technology Addiction and a professor at the University of Connecticut's School of Medicine. The study in May was of cellphone owners ages 16 to 65 who drive almost every day and text at least once a day. It has a margin of sampling error of plus or minus 3.1 percentage points. Researchers conducted surveys with people on their cellphones, and it's possible those who would have picked up on a landline might have different attitudes. It's also possible attitudes among those who don't text as often are different. Researchers excluded 343 people because they didn't text or drive enough to meet the criteria. After those and other exclusions, 1,004 U.S. adults completed the telephone survey. Greenfield said the survey is the latest to show a discrepancy between people's attitudes and behaviors. It found a broad range of reasons why drivers text. Forty-three percent of the texting drivers said they want to "stay connected" to friends, family and work. Nearly a third did it out of habit. — Twenty-eight percent said they are worried about missing out of something important if they don't check their phones right away. — More than a quarter believes that their driving performance is not affected by texting, and just as many people said they believe that others expect them to respond to texts "right away." — Just 6 percent answered that they are "addicted to texting," although 14 percent admitted that they are "anxious" if they don't respond to a text right away, and 17 percent feel "a sense of satisfaction" when they can read or respond to a text message. "It's something I struggle with every day," he said. "I know that I need to go out and talk to others about it. I don't want others to make the same mistake I did." Shaw does not remember what he was texting about right before the accident. Back then, he said, "being on my phone when I drove was something I did all the time. It was just driving to me. I guess you'd call it ignorance but I never understood that it was dangerous. How could me being on the phone cause a car accident?" Today, his phone is off when he's driving. Never in the past eight years since the accident, he says, has he gotten a phone call or text message that was so important that it couldn't wait until he stopped the car. Greenfield, who studies the effects of digital technology on the brain, likes to call smartphones "the world's smallest slot machines" because they affect the brain in similar ways that gambling or drugs can. Dopamine levels increase as you anticipate messages, and that leads to higher levels of pleasure. Getting desirable messages can increase dopamine levels further. While all distractions can be dangerous, much of the focus has been on texting and driving, Greenfield said, because "it's ongoing and because there is an anticipatory aspect to it." Greenfield said people should not use their phone at all while driving, but acknowledges that this might not be realistic. Apps, public education and laws that ban texting and driving, he said, will all help change people's behavior, just as anti-drunken-driving laws and public education campaigns have reduced drunken driving over the past few decades. Perhaps people confuse cellphone use in general with texting, and think it's all the same. Speaking on a phone while driving increases your risk of accident by about 30%. Its roughly on par with other distractions like changing channels on your radio or talking to the passengers. Texting on a phone increases it by 2200% or 23 times over.